CARDIFF, United Kingdom— Earlier this summer, broadcast sound specialist Red TX commissioned its new RED II mobile recording unit, which has been designed specifically to cater for 3D and 7.1 surround sound productions. Based at Pinewood Studios, the truck was pressed immediately into service at a Linkin Park concert in Moscow’s Red Square, followed by the Download Festival and other high prestige events such as the Red Hot Chili Peppers’ worldwide launch of their new album in Cologne—which was filmed and broadcast live to 1,500 cinemas around the world. But most recently they recorded Michael Forever—the MichaelJackson Tribute Concert at Cardiff Millennium Stadium. Equipped with a HARMAN Studer Vista 8 (as is their original RED I production vehicle), they are finding that Studer’s new SCore Live engine affords them a lot more flexibility than they have been accustomed to. 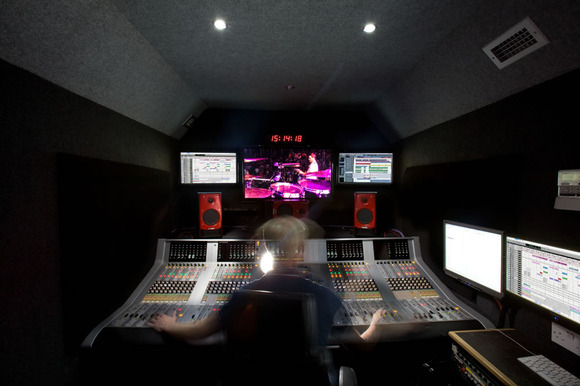 The truck features the highest insulating specifications while the main studio area is a lead-lined, floating room within a room, equipped with active 7.1 surround sound monitoring and the SCore Live-powered Studer Vista 8. 96 x 24/96 remote mic amps are included as standard, with additional blocks of 48 (up to 240) available for larger projects. All microphone inputs are 24bit/96kHz with full DSP on every channel. Once Red TX had painstakingly set up audience mics to capture the audience, they mixed 140 channels from the stage via 3 x 48-way stage racks (including eight returns), compressed down to 128 and recorded onto Pyramix. Musical acts that participated in the event included the Jackson Brothers, Christina Aguilera, Beyonce, Alexandra Burke, Alien Ant Farm, Craig David, LaToya Jackson, Leona Lewis and Smokey Robinson. And while copyright issues blighted the prospect of live broadcast to around 30 countries throughout the world in 2D and 3D formats, it will now be broadcast at a later stage. Finally, Ian Dyckhoff confirms that reality TV spectaculars such as XFactor and Strictly Come Dancing are also benefitting from having a Vista 8 in the new production unit. “It’s clear that the presence of Studer is winning us extra work,” he said, as he prepared RED II for its next mission—the opening night of the Coldplay European tour in Madrid.